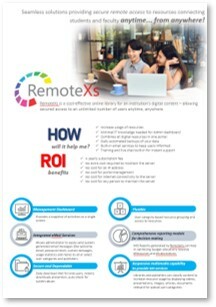 RemoteXs has enabled all leading institutions (academic or research) in optimizing usage of the precious eResources and nurturing research interests of faculty and their students. RemoteXs has an ability to provide secured access to scattered eResources of the institution, bringing them under one umbrella, along with subscribed eJournals, eBooks and all other eContent, that too anytime …from anywhere. RemoteXs cost-effective cloud-based service model has enabled progressive libraries in creating their own Digital Library Portal with facilities to reach their target audiences in efficient manner. * Transparent Usage – Provide fair and unique insights on e-resources’ usage. * Single ACCESS POINT, RXS come with CMS which allow library to setup a Resource Portal. * SaaS – Low Cost Implementation. * Ideal Solution for library consortium. * USAGE (WHAT, HOW are they using?) and how is it compare to others? With fast expanding e-resources such as e-journals and e-books, we are subscribing to an easy-to-use RemoteXs to manage the resources in one platform and allo remote access to encourage much higher usage. RemoteXs has also helped our university users to access from different devices within and outside of campus. RemoteXs is extremely helpful for students who stay outside of campus to assess our e-resources. We have seen a strong take-up in number of registered users via the RemoteXs, which helps to ramp up resource usage. Increase in use of e-resources. Enhances service quality by providing this (facility) to users when not on campus, especially during their summer internships. This also helps the students in improving the quality of their summer work. User convenience has led to increase in satisfaction of library services. We are using Remote Access facility from Eclat. Our students and faculty are able to access our subscribed e-resources through this RemoteXs facility. Also students are using it during their summer internship when they are out of Ranchi.